Yesco Adaptable Database Perth WA Western Australia. BusDiary is a software system developed for small, medium and large bus charter operations to record bookings, send confirmations, schedule fleets, generate driver jobsheets, generate invoices, create booking forms and advertising material. BusDiary pays for itself by saving office time! BusDiary pays for it self by increasing fleet efficiency! BusDiary pays for it self by increasing bookings! The 'Diary Page' shows a clear listing of all bus movements for a day in clear large fonts. One click to change the sort order to 'Time', 'Bus' or 'Driver'. One click to print a Drivers jobsheet or to print all jobsheets. Drivers telephone and customers phone displayed against each transfer. Easy scheduling using popup lists of drivers and buses. Drivers jobsheets can have four formats and can be printed or sent by email or directly faxed from the computer using Yesco Autofax without retyping the fax number. Emailed Driver jobsheets have the details in the body of the email and a printable version as an attachment in pdf or rtf format. The 'Bookings Page' shows all current bookings in large clear fonts. One click chages the sort order to 'Booking Order', 'Date Order', 'Invoice Order', 'Client Order'. Quotes appear in another colour so that staff follow up. Invoicing is a single click. Bookings ready for invoicing are highlighted. Booking search is integrated into the page. Confirmations are a single click and can be sent by window envelope, email or directly faxed from the computer using Yesco Autofax. Invoices are a single click and can be sent by window envelope, email or directly faxed from the computer using Yesco Autofax. Quotes can be added by three methods and can be sent by window envelope, email or directly faxed from the computer using Yesco Autofax. Bookings are added by a 'fast fill' method where pickups and dropoffs are remembered for each client. Repeat bookings can be remembered in a 'Master Booking'. 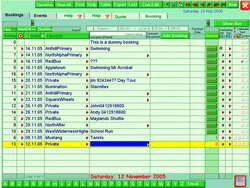 Complete bookings with all movements can be copied and added again. A set of swimming transfers, say ten transfers on one day can be Splat into ten following days in about one second. Emailed Confirmations, Quotes and Invoices contain the information in text in the body of the email and as a printable attachment in rtf or pdf format. Booking Form. Add and edit bookings using this form. 1999 modified to suit different bus companies. 2000 Database linked to Quickbooks. 2003 Booking Copy (Splosh) added. 2004 Booking Copy (Splat) added. 2005 Heavily modified to schedule helicopters, planes and work rosters for offshore oil platforms. 2005 Modified to suit Limousine operations. 2006 Fast Booking (Red Hot Fill) entry added. 2006 Send as pdf added. 2006 Editable signatures and emails. Yesco IT is a small computer company based in Perth Western Australia. Yesco is a database system designed for use by small and medium bus companies. The program covers almost all of the tasks needed by a charter bus company. The program is also suitable for other industries including Limousine business. Emailed Confirmations, Quotes, Invoices, Jobsheets.